No, former U.S. President Jimmy Carter isn't actually building or repairing all 100 homes by himself... but his namesake program, the Jimmy Carter Work Project, is doing so before the end of the year. I've said many times that building more quality affordable housing is crucial to our city's future. 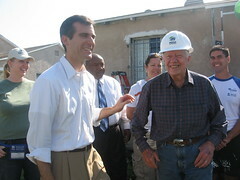 Our city is fortunate that South L.A. and San Pedro were chosen for the 2007 Jimmy Carter Work Project to raise awareness about the area’s need for affordable housing. Abandoning homeless patients on the streets of skid row is wrong and a practice we see all too often. It leaves people vulnerable and unprotected at a time when they are in the greatest need of care. This morning, I joined Councilwoman Jan Perry in introducing legislation that would make this practice illegal in Los Angeles. Creating a more seamless transfer process between hospitals and homeless services will give patients the opportunity to get off the streets and start rebuilding their lives. I joined developers, architects, planners, and open space advocates at Public Space LA!, a day long symposium hosted by the LA Chapter of the American Institute of Architects dedicated to examining the unique challenges and opportunities that face Los Angeles in our efforts to preserve and create open space. We need to capitalize on our open space opportunities and embrace one of the major components of civic intersection - our city parks. In the past, we turned our back on public open space because everyone had their own private space - their backyards. As Los Angeles has changed, so too has our attitude toward our open space. Our parks are part of a much broader urban context, one that examines their impact on the environment and on our communities. They figure into our watershed, holding the potential to become catchments that clean our water rather than conveying pollutants to the LA River or Pacific Ocean. They are places for our children to play, and it is only by encouraging community participation and community ownership that we can transform our parks into places around which our neighborhoods grow. Parks stand at the crossroads of urban revitalization, giving us a place to interact while becoming an active part of our effort to clean our environment. Marsh Street Park is a perfect example of how parks have become an active part of our environmental and communal dialogues. Next to the LA River in Elysian Valley, we have built a park that filters the water before it reaches the watershed. Right next door is a skate park that was designed by some of the young people who now skate on it. By creating a sense of environmental stewardship and community ownership of these parks, we have changed Elysian Valley’s idea of a park, and the community has changed with it. 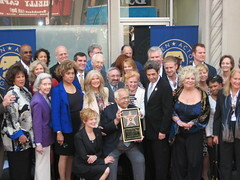 Today I joined a number of actors in celebrating the installation of the Screen Actors Guild's (SAG) Award of Excellence star on Hollywood Boulevard. The award also celebrates the 75th anniversay of SAG's fighting to enhance actors' working conditions, compensation, and benefits. As a card-carrying SAG member, I'm looking forward to telling everyone I now have a star. Today we took another step closer toward meeting Los Angeles' great need for quality, affordable housing - we opened the doors to Laguna Senior Apartments, a complex for seniors in a mixed-income, mixed population setting. 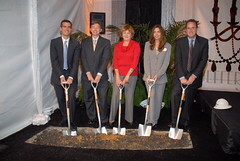 The apartments feature 64 units, a computer lab, a media center, and laundry facilities. The beautiful new complex is the result of a collaborative effort between the Affordable Housing Community Development Corporation and Project New Hope, a nonprofit dedicated to improving the lives of seniors with HIV/AIDS. 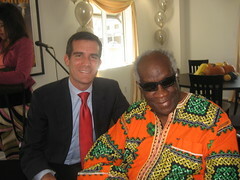 This project is an example of government at its best -- working in a public-private partnership to provide housing for seniors such as Howard Tubbs (seen here) who joined me at today's grand opening. October is Domestic Violence Awareness Month, and I joined the city’s Domestic Violence Task Force in drawing attention to this plight that affects every community. Connecting victims with services and support to get out of abusive relationships is critical to ending domestic violence and creating safer communities. Domestic violence is all too familiar for many in Los Angeles. Out of shame or fear, victims often remain in the shadows of an abusive relationship, afraid to ask for help or seek out services. That fear and shame can be compounded for victims who don’t speak English, whose immigration status is uncertain, or whose sexual orientation is wielded as a threat to keep them in an abusive relationship. We are committed to helping every victim get help and stay safe. 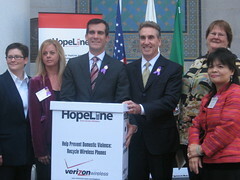 As part of this year’s awareness campaign, the City of Los Angeles has partnered with Verizon Wireless to bring HopeLine to Los Angeles. At City facilities throughout Los Angeles, including my Hollywood office at 5500 Hollywood Blvd., you will see boxes like the one pictured here where you can drop off cell phones and accessories to help victims of domestic violence. HopeLine has raised more than $4 million in grants to DV shelters and given more than 40,000 phones to victims of domestic violence. This month, every Angeleno has the opportunity to help victims of domestic violence by simply cleaning out their junk drawer and donating their old wireless phone. Already in the midst of a housing crisis, the recent woes in the subprime market have made the dream of owning a home an increasingly remote possibility for working and middle class families in Los Angeles. The full impact of this downturn was laid out at the Los Angeles Business Council’s 6th Annual Mayoral Housing Summit, a regular gathering of policymakers and opinion leaders dedicated to improving LA’s housing situation. The bad news is that we expect the foreclosure crisis to worsen in the coming years. The good news is that there is something we can do about. Earlier this year, my office did a press conference with Operation HOPE, a mortgage-counseling hotline that connects homeowners with financial services representatives. Within 24 hours, the hotline had received over 3,000 phone calls. 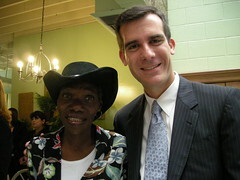 Creating financial counseling opportunities for all Angelenos is an important first step. More relief efforts are on the way. I’m currently working with the Housing Department to create a fund that will help to preserve the stock of affordable rental units in the city. The Affordable Housing Trust Fund continues to build more housing stock in the city, bringing the price within reach of those trying to settle their families into a home. Addressing the housing crisis will take a coordinated response from government, the financial sector, and the city’s builders. One of Hollywood’s favorite traditions -- the annual holiday parade -- will once again march down Hollywood Boulevard this November. 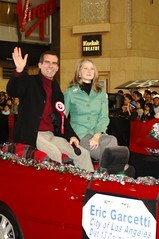 After an announcement earlier this year that the Hollywood Chamber of Commerce would no longer produce the annual parade, Councilmember Tom LaBonge and I worked to revive the celebration for a 76th year. The Hollywood Santa Parade will honor the pageantry and festive spirit of the Hollywood Christmas Parade and will feature Mary J. Blige, the cast of Disney’s High School Musical, and American Idol finalist Elliott Yamin. Hope to see you on November 25! Community-centered design is at the core of Hollywood’s redevelopment, a principle reflected in the new Jefferson at Hollywood mixed-use complex. Ten percent of the units will be affordable, with live/work units and retail space that will front Highland Avenue. The project’s architect worked with my office’s Hollywood Design Review Committee to create a pedestrian-friendly environment along the ground floor, and to integrate the building with its surroundings. Weaving new development into the existing neighborhood fabric allows us to realize Hollywood’s potential while honoring its past. This morning, Fannie and I were at the Downtown Women's Shelter (where she is a client) to announce HomeWalk, a 5K walk to raise funds for and awareness of local efforts to end homelessness. The walk will be held on November 17 in Exposition Park and is part of United Way of Greater Los Angeles's focused effort to prevent and end homelessness in L.A. County. Similar walks will also take place in other cities around the country. Every night, thousands of adults and children sleep on our city's streets. Fannie has been one of them. HomeWalk is an opportunity for each of us to get involved in helping to end homelessness. 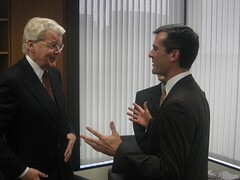 On the day that Al Gore was honored with the Nobel Peace Prize for his work on climate change, I was honored to welcome Icelandic President Olafur Ragnar Grimsson (pictured) to Los Angeles to announce the opening of the North American Headquarters of Iceland America Energy, a clean tech firm investing in geothermal energy throughout the continent. Their investment in clean energy will help our environment, and it will strengthen our economy by providing high paying jobs for Angelenos in the booming green industry. Los Angeles has a new home for all things historical at the revamped Office of Historic Resources Website. 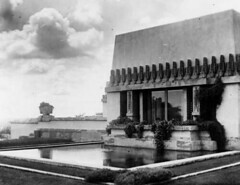 You can take stock of the nearly 900 historic-cultural monuments (including Hollyhock House, pictured here) in Los Angeles, find out whether or not your neighborhood includes an historic preservation overlay zone, or discover preservation incentives at the city, state, and federal levels. Also, be sure to fill out SurveyLA – an ambitious, multi-year LA Historic Resources Survey. Two days. One topic: how to take a more comprehensive approach to addressing clean air, clean water, and land use issues in our city. This week, the City Council's regular meetings had a special focus on environmental issues. We heard from key departments and environmental community leaders on what the city has done, is doing, and needs to be looking at to make Los Angeles a cleaner and greener city. From our leadership in waste diversion (Los Angeles leads the nation in recycling 62% of its waste materials) to the challenge of conserving water in drought conditions, we examined a variety of air, water, land, and environmental justice initiatives. We came away with more than 80 recommendations for new policies and initiatives for the City Council to consider. In the next few weeks we will be analyzing these recommendations and working through Councilmember Perry’s Energy and the Environment committee to take action on them. I want to thank the many people involved in the success of this first-ever Council meeting focused on a single topic. I especially want to acknowledge the environmental community organizations that participated in the meeting: Global Green, Heal the Bay, TreePeople, Sierra Club, Natural Resources Defense Council, Santa Monica Baykeeper, Santa Monica Mountains Conservancy, Coalition for Clean Air, Center for Energy Efficiency and Renewable Technology, Communities for a Better Environment, and East Yard Communities for Environmental Justice.